Powell River show sold out! Due to an illness, the Feb 24 show in Campbell River has been rescheduled until April 7, 2018. Vancouver, BC, March 6, 2018 — Paul Mercs Concerts is pleased to announce that the 54-40 concert for the Powell River date is sold out. Vancouver, BC, February 24, 2018 — Due to an illness, 54-40 regrets that they are unable to proceed with tonight’s Feb 24th performance and have rescheduled to April 7th. Vancouver, BC, December 4, 2017 — Paul Mercs Concerts is pleased to present the following tour dates of one of Canada’s most iconic rock bands, 54-40. Vancouver, BC, November 14, 2017 — Paul Mercs Concerts is pleased to announce that due to an overwhelming demand for the 54-40 – A History Unplugged concert, a second show has been added on March 18th, 2018. Vancouver, BC, October 6, 2017 — Paul Mercs Concerts is pleased to present the following six tour dates of one of Canada’s most iconic rock bands, 54-40. 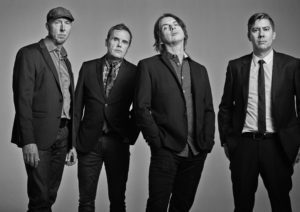 54-40 Unplugged: Songs & Stories is an intimate and reimagining of 5440’s greatest hits performed as you’ve never heard them before. Featuring original arrangements of violin, guitar, banjo, mandolin and more this performance gives new context and spirit to classic songs fans all know and love. In between songs the band engages with the audience sharing stories from their 30+ years together as a band. In January 2016 they released La Difference: A History Unplugged that feature 10 of their greatest hits recorded as you’ve never heard them before. 54-40 has an unbelievable catalogue of hit songs that they can pull from to include in their live performances. Songs such as Baby Ran, She La, Casual Viewin’, One Gun, Ocean Pearl, Love You All, Music Man, I Go Blind, One Day In Your Life, Radio Luv Song, Baby Have Some Faith, Miss You, Blame Your Parents, Easy to Love, Crossing a Canyon, Since When, Nice to Luv You, and Lies to Me. 54-40 is currently preparing for their 2017 release entitled Keep On Walking which will be released through El Mocambo Records. Nanaimo tickets available at www.porttheatre.com, 250-754-8550 or at the box office. Campbell River tickets available at www.tidemarktheatre.com, 250-287-7465 or the box office. Courtenay tickets available at www.sidwilliamstheatre.com, 1.866.898.TIXX (8499) or the box office. Abbotsford tickets available at chilliwackculturalcentre.ca, 604-391-7469 or the Centre Box Office. Kelowna tickets available at selectyourtickets.com, 250-762-5050 or the box office.